In this excerpt from his new book, Too Many Bosses, Too Few Leaders author Rajeev Pershawaria describes how managers can motivate people by appealing to the three things that really matter to them. production responsibilities in addition to their managerial roles. Don’t ask yourself what you can do to motivate them; try to find out how they are already motivated. you can to match their expectations with the work at hand. that gives them an opportunity to do what they like best. this individual find another job or role. following exercise before you continue reading the rest of this chapter. Imagine you are about to change jobs and have two competing offers. the two jobs? What factors will you consider while making your decision? you? Did you think about the work culture of the two organizations? with each other? Did you consider the reputation of the companies? list like that when making career decisions. all of their responses fit in with one or more of the three RED buckets. you can label and link day-to-day work with their expectations. if she gains cross-border expertise. is in keeping the dialogue going with your people. 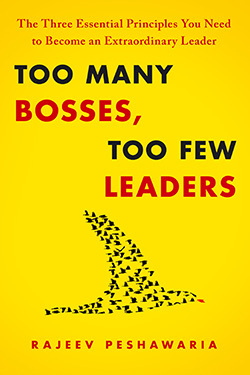 From TOO MANY BOSSES, TWO FEW LEADERS by Rajeev Pershawaria. Copyright © 2011 by Rajeev Peshawaria. Excerpted with permission by Free Press, a Division of Simon & Schuster, Inc.